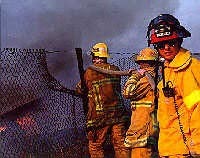 ( left ) Firefighters from Alhambra fighting a woodchip fire at a nursery in neighboring Montery Park. 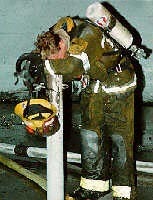 ( right ) A Firefighter from Los Angeles City Fire Department rests after knocking down a fire. 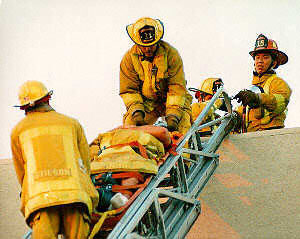 Firefighters from the City of Burbank rescuing one of their own.